Once the planning for the film "Ray" was underway, the filmmakers were faced with a daunting question: where would they find an actor able to embody such a highly recognizable and unique character from American culture? The answer was an unexpected one. Hackford and Benjamin decided to take a chance on Jamie Foxx, best known at the time as a stand-up comic and television star, but also an actor with whom they’d been impressed by his performances in Oliver Stone’s Any Given Sunday and Michael Mann’s Ali. When he met with Foxx, Hackford told the actor his main concern was that whoever played Ray Charles would have to reveal an innate relationship to the very soul of music. As it turns out, Foxx, similar to Ray Charles, had started playing piano at age three. The actor later led the band at his Texas gospel church in his youth and received a university piano scholarship. The next test was to have Foxx and Ray Charles meet  which they did at two side-by-side pianos, while the filmmakers held their breath. Hackford recalls the story: “Ray was not easy, as I’ve said, and when it came to music, he demanded perfection. Jamie Foxx came over and immediately started playing the piano and Ray could hear at least that he could play. Foxx had known little about Ray Charles beyond his music before being cast in the role, and found himself on his own personal journey into the man’s fascinating and embattled background. “When I read the script I realized that this was a really phenomenal story, not just about music, but abut a man who overcame all kinds of difficulties to become a real leader of the culture. The way he intertwined everything he experienced in his life to make this amazing music, it was really something special.” Foxx threw himself headlong into the role. After meeting with Charles, Foxx began by adapting many of the singer’s physical trademarks, from his close-cropped hair to his bodily mannerisms, born out of a combination of Charles’ history, blindness and unstoppable inner sense of music. The actor immersed himself in Soul, Jazz and Blues recordings to set the mood; attended classes at the Braille Institute; and spent weeks during rehearsal and production walking around with his eyes sealed tight for 12 hours a day, to gain an intimate understanding of what it really means be blind. “It was interesting to me that not being able to see made me angry at first,” comments Foxx. Many on the set where stunned by how spontaneous and natural the actor’s embodiment of Charles became. But imitation was never the point. “The key word for me was nuance, because I didn’t want to simply impersonate him,” says Foxx. To get even deeper into the soul of Ray Charles, Foxx began to consider the extreme highs and lows of his emotional life. Foxx calls Ray Charles’ childhood “a blessed curse,” an intense time of suffering that nevertheless marked the beginning of his development as an extremely open-minded artist. He says, “To a certain degree, I believe what happened to Ray as a child is what molded who he was, but it was a large price to pay. It shocked Foxx to think about how much drive it must have required to make it in a world that held forth obstacles of every kindwhether based on his race, his blindness or his initially lowly status as a backup musician. “What really amazed me is Ray’s business savvy. To be blind, and to have to trust other people’s word to a certain degree when it came to money and contracts, yet to control your own career in an era when nobody controlled their own career...wow. I came to see that Ray had a certain type of energy and charisma that really inspired people to be loyal to him and stay in his good graces,” says Foxx. Foxx was also moved by the love story behind Ray Charles’ early career with his devoted wife Della, who saw him through his darkest hoursdespite his infamous knack for seducing women he met on the roadand pushed him to face up to both his talent and the devils chasing him. “I know Della really loved Ray and vice versa. Early on, she must have said to herself, ‘I’m going to love this man in spite of anything he does,’ and she did. She was really a strong woman, and she held everything together and, in a way, I think she allowed Ray to be the artist he was,” says Foxx. “She was the glue in his life. The more he reflected on Ray’s tough reality and propulsive talent, the more Foxx understood why Charles indulged in so many illicit activities. “He lived in a very unpredictable word and there were only a few things he could count on,” explains Foxx. Despite the challenges of playing the many sides of Ray Charles, Foxx found an indescribable joy in the role, especially in trying to get to the bottom of Charles’ lifeloving, hard-driving energy. “You hear it in all those great songs,” says Foxx. 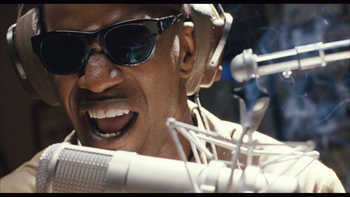 Ray Charles was excited to be portrayed by Foxx. Jamie Foxx (Ray Charles) is enjoying success in a multifaceted career that already encompasses dramatic roles in films and television, as well as stand-up comedy and music. Though previously best known for his comedy work, his emergence as a leading dramatic actor is evidenced in his most recent and upcoming roles. Foxx is set to star in the action thriller Stealth for director Rob Cohen, which is slated for release in 2005. Foxx recently received critical acclaim for his portrayal of gang member-turnedNobel Peace Prize nominee Stan Tookie Williams in the cable movie Redemption. He also starred opposite Gabrielle Union in the urban romantic comedy film Breakin’ All the Rules. Foxx first came to fame as a popular stand-up comedian and comedy actor. During the early 1990s, he was a regular on the comedy series In Living Color, alongside Keenan Ivory Wayans, Damon Wayans and Jim Carrey. He also had a recurring role on the series Roc, and guest-starred on several other shows. In 1996, he launched his own series, The Jamie Foxx Show, which became one of the top-rated shows on the WB network. Foxx not only co-created and starred on the show, but also served as an executive producer and directed several episodes. During the show’s five-year run, Foxx won an NAACP Image Award and earned three more nominations for Outstanding Actor in a Comedy Series. He went on to co-star with Will Smith in the 2001 biopic Ali, which marked Foxx’s first collaboration with director Michael Mann. His portrayal of Muhammad Ali’s corner man and constant inspiration, Drew Bundini Brown, brought Foxx another Image Award for Outstanding Supporting Actor in a Motion Picture. His additional film credits include Bait, The Truth About Cats and Dogs and The Great White Hype. In 2002, Foxx brought down the house in his first HBO comedy special, Jamie Foxx: I Might Need Some Security. He also has the distinction of hosting the top-rated Saturday Night Live of the 2001-02 season.